There surely isn’t a harder working comedian than Richard Herring – and no trip to the fringe would be complete without a set from him. This year we also have the opportunity to see a play he’s written, I Killed Rasputin (more of that in due course). 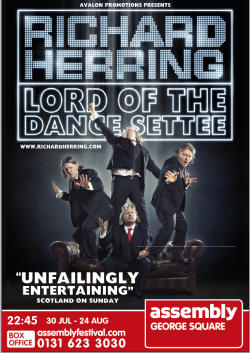 His stand up event, Lord of the Dance Settee, is perhaps less tied to a concept than previous outings; he himself describes it as a collection of ‘bits and pieces’ – but that hardly does it justice. A visibly slimmed down version of Herring bounds enthusiastically onto the stage and launches into some recollections from childhood – though of course, these are much more edgy than they would be in the hands of a lesser comic – and you find yourself laughing (sometimes uncontrollably). Just when you think the event is going to be allowed to peter out, he ties everything together, quite brilliantly, with an ending he’s asked reviewers not to reveal… So I’ll simply say that it is joyful, heart warming and totally unexpected. It’s been said before (mainly by him) but Herring really is the King of the Fringe. Long may he reign.